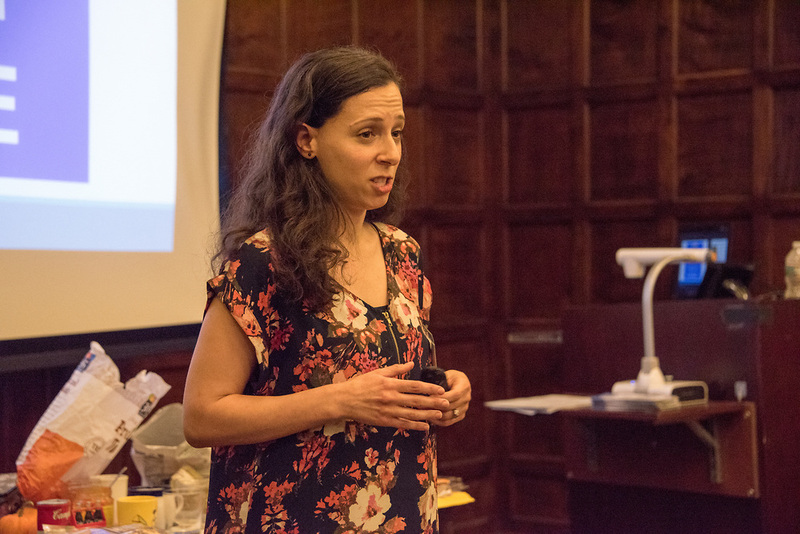 Tufts Food Rescue Collaborative (TFRC) launched their Tufts Food System Rescue series yesterday with the event The Ethics of Eating, featuring guest speakers from the Ethical Choices Program as well as Assistant Professor of Anthropology Alex Blanchette. The event series is a part of TFRC’s larger effort to facilitate more student involvement and conversation events. TFRC is an organization that partners with Tufts Dining, Food For Free, the Environmental Studies Program (ENVS), the Jonathan M. Tisch College of Civic Life and other groups on campus to prevent food waste and distribute leftover food to communities in need, according to a video about the program on the ENVS YouTube page. The organization started packaging meals to be distributed to local families last fall through a partnership with Food For Free, a Cambridge-based food rescue organization, according to TFRC Co-President Josie Watson. TFRC volunteers package food in Carmichael and Dewick-MacPhie Dining Centers six days a week. They receive a training that allows them to access the kitchens without food-handler licenses, where they package single-serving meals, according to Watson. The TFRC Facebook page boasted donating 197 meals from the beginning of the year to Oct. 20. After the food packaging program took off, Tufts Dining hired hire two student interns to manage volunteers and package meals, according to Watson. Now, Watson and Co-President Lucy Zwigard are currently transitioning the organization to one with more student leadership. Part of this increased student involvement will include developing a more consistent method of scheduling students to package food for Food For Free, according to Watson. Additionally, Watson and Zwigard are seeking students to take leadership roles after they graduate in the spring. Watson and Zwigard are also expanding the program to promote conversation as well as action. She said these conversations inspired the Food System Rescue event series. “We came up with this Food Systems Rescue event, where every once in awhile we could put together an atmosphere [in which] people could discuss the food system in general,” Watson said. The Ethics of Eating forum was the first in a series of events intended to promote discussion related to food ethics and health, according to Zwigard. The discussion began with a presentation by Alisa Marvel, a field educator from the Ethical Choices Program (ECP). Marvel explained that ECP is a nonprofit organization that educates students from middle school to college on the impact of their food choices on their health and the environment. “I think that young people have the [ability] to make their food choices for themselves. I think it’s important to be educated and to learn where our food comes from [and] how it might affect our health and environment, so people can be educated to make the best choices possible for them,” Marvel said. Throughout the presentation, Marvel stressed that ECP’s goal is not to tell anyone what food decisions they should make; instead, ECP focuses on education and equipping young people with the resources to make informed decisions. Marvel’s presentation also featured video documentation of conditions in the meat and animal product industry, as well as an interactive demonstration. Following Marvel, Blanchette gave a short presentation on food systems and animal production in the United States, based on his work studying the evolution of U.S. pig farms. Blanchette’s work focuses on the codependence between humans and animals created by the meat industry and how this relates to speciesism. The event featured food catered by Food Link, an Arlington food rescue nonprofit. In the future, Watson and Zwigard hope to host more events to both serve the local community and encourage an open conversation about food ethics. They also hope that these events will build a curious and conscious community. “It’s a presentation to foster discussion and definitely to foster unity, to bring together everyone with this interest so they can recognize each other,” Watson said.